Congratulations, you just found out you're pregnant with twins! Take a deep breath and get ready; you're about to embark on a special and unique journey. Your fatigue may be much more pronounced throughout the entire pregnancy. It's important to give your body the time it needs to rest - take lots of naps, and resist the urge to overdo it! Anticipate getting lots of rest and allow yourself to relax - especially as you get further into your pregnancy. You are likely to have worse morning sickness when you're carrying multiples. Herbal remedies such as ginger or fennel seed can help ease symptoms. Women carrying two babies can expect to grow larger and gain more weight faster. Normal weight gain for a mom of twins is between 35 to 45 pounds. While many women worry about gaining weight - it's an important aspect of carrying twins as proper weight gain reduces the risk of preterm labor. With all this weight gain comes a bigger stomach. As a result, consider getting a maternity support belt to help ease the back burden of carrying two babies. One of the great things about being a mom of twins is that you will generally feel your babies move often. Most first time moms feel fetal movement in twins the same as singleton moms do - about 18 to 20 weeks. However, if this is not your first pregnancy or you are especially petite, you may feel your babies earlier. In addition, you will feel movement more often as the babies run out of room faster. If you decide to have an alpha-fetoprotein test (AFP), (a blood-based pregnancy test typically taken around 24 weeks), you will get a positive result. 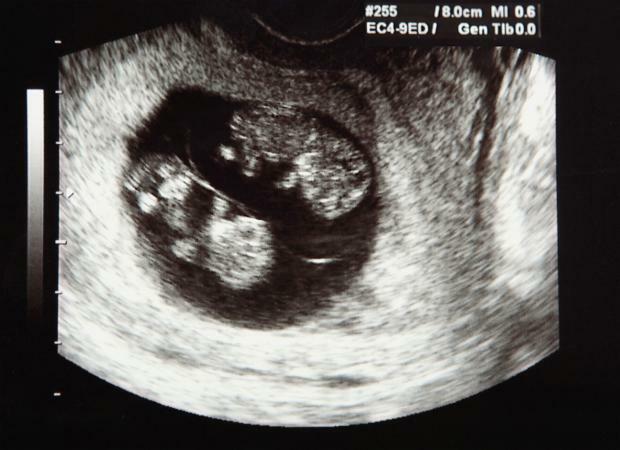 Some women find out they're carrying twins when they get a positive AFP and their doctor schedules more tests. Most people know about identical and fraternal twins, but there are, in theory at least, several types of twins. The type depends on when the egg splits and how the sperm fertilizes each egg. There is no genetic predisposition yet discovered for conceiving identical twins, but fraternal twins can run in families. You may experience stronger pregnancy symptoms earlier on compared to someone having one child. Severe morning sickness and rapid weight gain may indicate the first signs of being pregnant with twins. In the womb, twins have been known to start reacting and interacting with each other as early as 14 weeks. Your doctor may recommend you eat around 3,000 to 3,500 calories a day if pregnant with twins. Twins tend to come early, and on average, are born around 35 weeks. If you're writing a detailed birth plan, plan both for a natural birth and for the kind of intervention you want should the birth not progress as naturally as you'd like. Keep in mind that as a twin mom, you are at greater risk for preterm labor and for a cesarean birth. The bottom line is, no one wants to be making decisions about anesthesia mid-birth. Hope for the best, but prepare for potential complications. You may be feeling a myriad of different emotions right now. Take some time to process this incredible moment in your life and reach out to friends, family, your partner, and your doctor if you have any questions or need some support.